These were never intended to be “Dutch” fully segregated, high-capacity cycle routes. They are there to assist confident cyclists getting to work and back along the major roads. 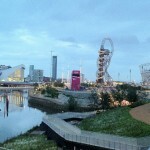 The project included reconfiguring many junctions to make them safer for cyclists too. However, too often, the “Superhighways” are just specially surfaced sections of roads, with no physical or optical barrier stopping trucks and cars driving along them. Worse, some sections are badly breaking up, with the surface disintegrating – most likely due to motorised traffic rather than the bicycles themselves. I understand that the project included funds to keep these maintained but that’s clearly not happening. A real Cycle Superhighway would have been a lane in each road closing to motor traffic, which is happening in other cities (Vancouver, Washington DC to name but two). But with one measure of the transport authority’s performance being the average speed of traffic across its network, this was never likely to happen on the trunk roads. A very well used two-way cycle facility on a key east-west cycle route in London, the cyclists’ parallel to the heavily trafficked Euston Road. Sadly it is so busy with cyclists now that, at rush hour, with the lane only wide enough for one bicycle, the queues can stretch back beyond the previous junction. 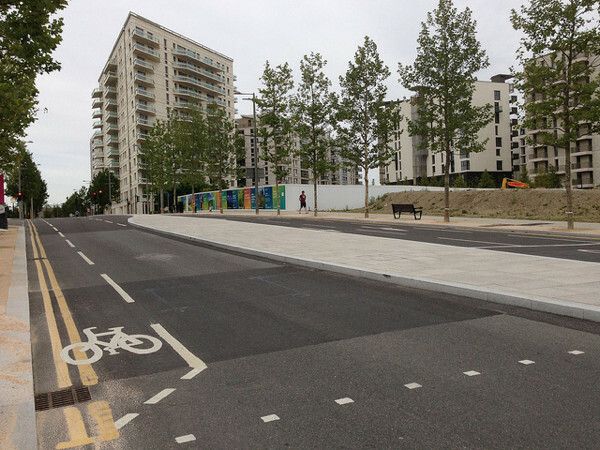 It’s therefore faster to cycle along the road during the rush hour – except you get hassled by taxis and other traffic when you do, because apparently the rest of the road is out of bounds to cyclists if there’s a cycleway. The cycleway also includes an odd section where the two cycle lanes pass each other on their left – minor cycle-cycle collisions are frequent. Pedestrians often also cross the lanes without looking, with poor sight-lines, resulting in frequent frustrated yells from oncoming cyclists. 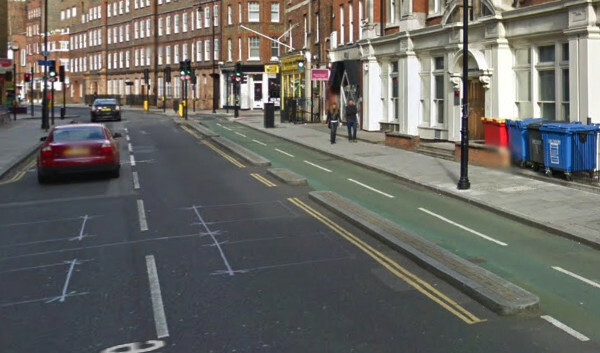 The route needs the Royal College Street armadillo treatment, and the Camden Cycle Campaign has recently launched a project to encourage this to happen. Encouragingly, two-way cycling on one-way streets is happening in quite a few places now – Hackney borough and the City of London Corporation, in particularly, have been taking the simple steps to allow quiet roads to be one-way for traffic, but two way for cyclists, without building complicated and often unnecessary dedicated cycle routes. Most European cities – Paris, Brussels and Vienna to name but three, are full of these kinds of streets. 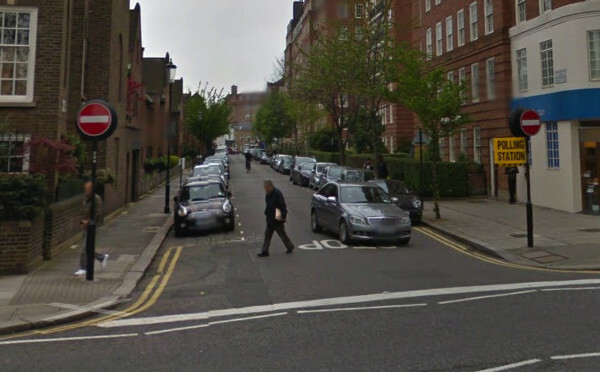 However, in London a great many side streets remain as impermeable for narrow bicycles as they do for big cars and trucks. There is often no reason why other than historical convention. 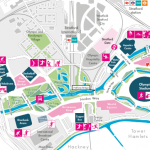 A whole brand-new neighbourhood being created, and a great chance to create a sustainable transport utopia, along with direct, spacious cycleways between east and central London, avoiding the traditional big roads? It’s still early days, but it doesn’t look like it’s going to happen. 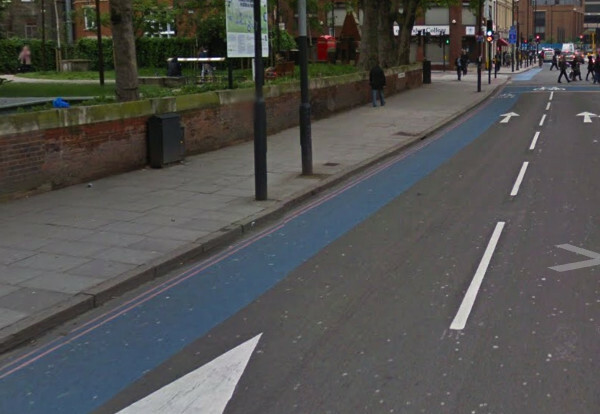 There’s just the “usual” cycle lanes which cars can drive in. There are a few dedicated sections, which are wide and straight, but it’s not all joined up. A real missed opportunity. For streets managed by the central transport authority, rather than the individual boroughs, it seems that dedicated bicycle paths are out of fashion. 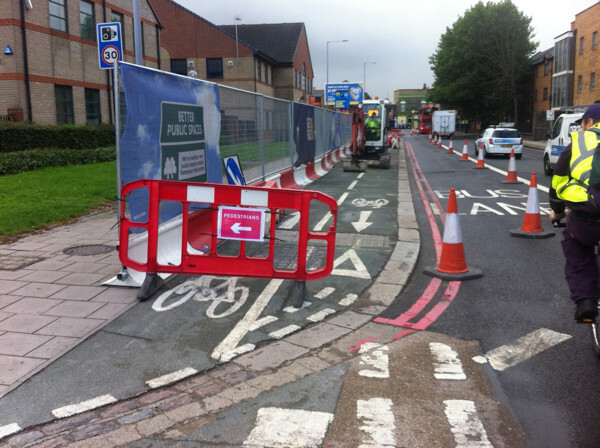 The photo shows a cycle path on a wide pavement, about to be bulldozed away. It was never a great path, and not particularly popularly used (and often walked upon by pedestrians, hence the sign here), but it was still better than being on the road with the traffic. Original plans for the road rebuild here showed the cycle path being retained (Map D) but the plans were quietly updated and now show it gone. 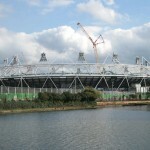 It will be replaced by a wide pavement with trees, the three-lane one-way road beside going to a two-lane two-way road. You can tell its a centrally managed street, by the way, because of the lines on the edge of the street being pink rather than yellow. There are other examples of junction rebuilds happening where dedicated infrastructure for cyclists appears to be being designed out. First three photos: Google Streetview. Fourth photograph: Diamond Geezer.